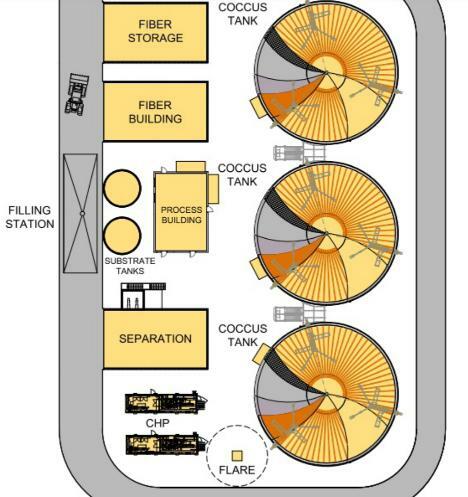 Offered by BIOFerm, COCCUS® is a complete mix anaerobic digester that is operated at the mesophilic temperature range. It is designed for input materials with a low solids content (between 8 – 12%). The tank is a reinforced concrete design with 2 or 3 large REMEX® paddle mixers. The drive motor of the mixer is mounted on the outside wall of COCCUS® so that only the polyamide bearings are located inside the fermenter. The tank is heated through hydronic heating installed onto the interior tank wall. 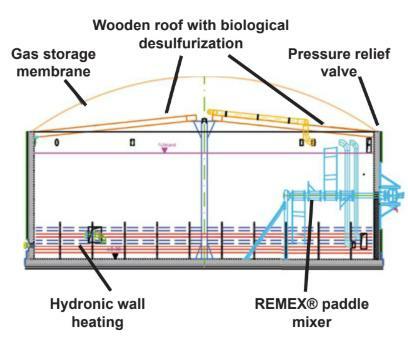 Biological desulfurization is integrated into the wooden roof structure of the gas storage which provides for a cost effective removal of a large part of the hydrogen sulfide. For cost-effective removal of hydrogen sulfide, biological desulfurization is integrated into COCCUS®’s wooden roof structure in the gas storage. fertilizer compared to untreated manure. 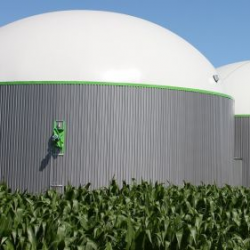 Renewable Natural Gas (RNG): creating RNG, electricity or heat from organic waste helps make an operation energy dependant and protect from fluctuating energy prices.